THIS IS A CASE OF 12 4-OZ BOTTLES. FREE ground shipping within the USA. We will ship this item to the billing address only, unless otherwise specified in the "Special Instructions" box on the Checkout page. 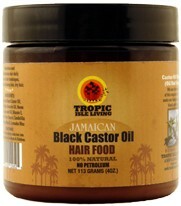 Tropic Isle Jamaican Black Castor Oil Hair Food Pomade is 100% natural! It is a combination of pure Jamaican Black Castor Oil with other oils, essential oils and plant wax known for nourishing and moisturizing the hair and scalp. Tropic Isle Jamaican Black Castor Oil Hair Food Pomade contains no petroleum or other unnatural ingredients of any kind. It is 100% pure. Use ths Hair Food Pomade for hair breakage; to help prevent dry scalp, dandruff, thinning hair, and other scalp conditions. For even better results, use after treatment with Tropic Isle Protein Conditioner. No, do NOT list me on your website.